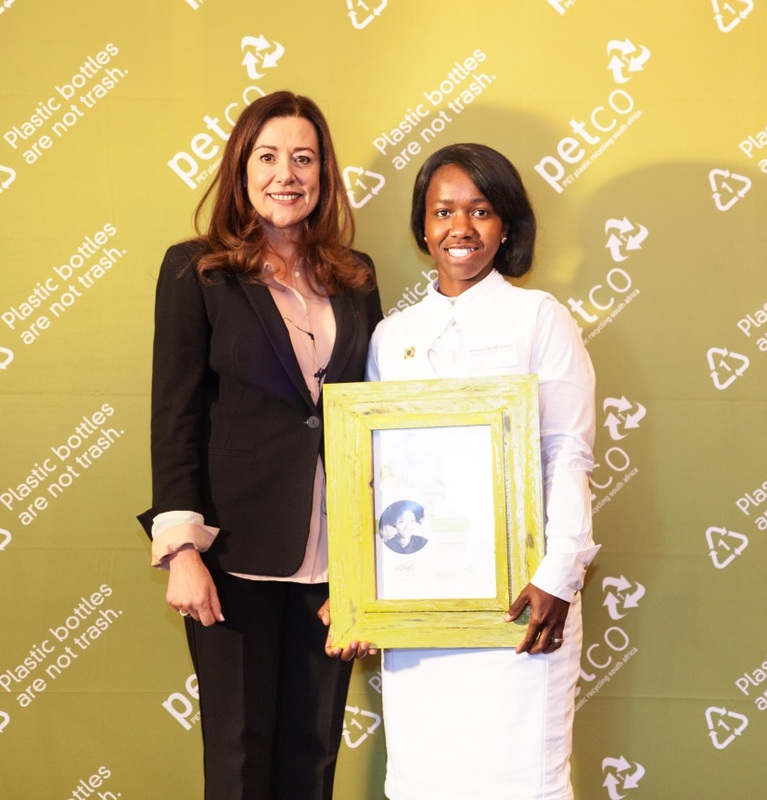 The extraordinary contributions to PET (Polyethylene Terephthalate) recycling in South Africa during the course of 2016 by 10 individuals and companies were celebrated at an awards ceremony as part of the PETCO Annual General Meeting, held today at the Radisson Blu Sandton Hotel in Johannesburg. 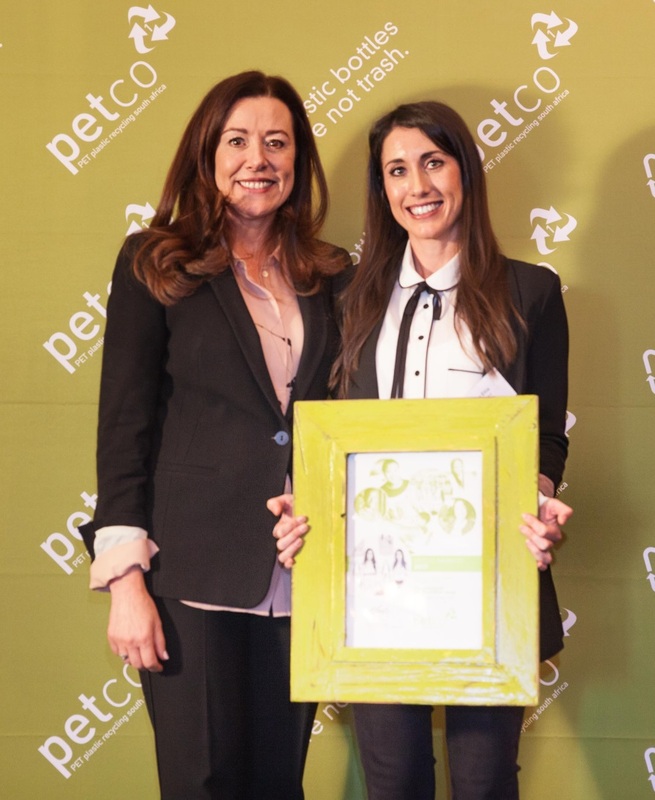 The PETCO awards are designed to recognise individuals, organisations and companies that contribute significantly to advancing PET recycling, whilst reflecting the principles of Extended Producer Responsibility and circular economy-thinking in their practices. This year’s awards, which formed part of the company’s 12th AGM, emphasised the remarkable achievements realised in 2016. 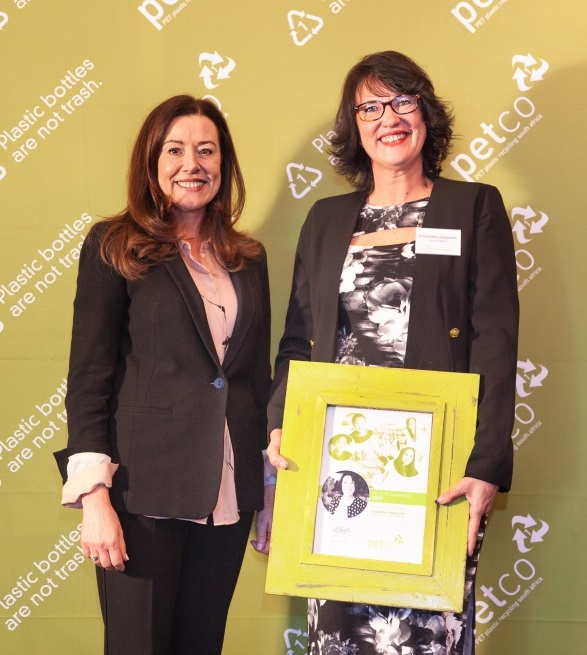 In its latest results, PETCO reports that the organisation recycled 55% of post-consumer bottle PET, equating to 2 billion PET bottles collected for recycling across South Africa over the course of 2016 and creating some 62 000 income opportunities. Financed by a voluntary recycling fee paid annually by members, PETCO has collected over 500 000 tonnes of post-consumer PET bottles for recycling since its incorporation in 2004, saving almost 800 000 tonnes of carbon and over 3 million m3 of landfill space. Awarded to public, private or non-governmental organisations that exemplify excellence in recycling with respect to public education and awareness programmes. The Waste Trade Company, located in Port Elizabeth in the Eastern Cape, creates awareness through involvement in local initiatives and through the implementation of recycling initiatives at events in Nelson Mandela Bay. The Schools Recycling Project services Port Elizabeth, Uitenhage, Despatch, Kirkwood, Addo and the Sundays River Valley area. Through their programmes, they collected 59 973 kg of PET during the course of 2016. Since 2003, the Recycle Swop Shop in Masakhane, Gansbaai has been enriching children’s lives by encouraging them to recycle and then rewarding that effort. Last year, an astonishing 14 940 kg of recyclables were collected by 6 054 kids, which would have otherwise ended up in the ocean. So, with this simple, yet effective community project, White Shark Projects also helps the community to do their bit for the conservation of our ocean and our environment. The Recycle Swop Shop is very popular and subsequently, Masakhane is one of the cleanest communities in South Africa. Awarded to a company or organisation that has displayed high levels of innovation and expertise in addressing the design, technical and manufacturing challenges associated with increasing the percentage of recycled PET resin included in the product/s that they manufacture. The Joinery, for their ‘My Office’ range. Focused on methods of production that contribute to local community growth, the Ellis sisters – Natalie and Kim – have devoted much of their time to researching and creating their own sustainable fabrics. In conjunction with PETCO partner Propet, The Joinery has conceptualised a fabric that looks similar to felt but is made from discarded plastic PET bottles collected around Cape Town. This new range of tech accessories called ‘My Office’ is handmade by local seamstresses and artisans from rPET, and features a multi-purpose laptop sleeve made from the material of 5 recycled plastic bottles. Since May 2016 they have used around 15 000 PET bottles in their products, diverting these bottles from landfill. 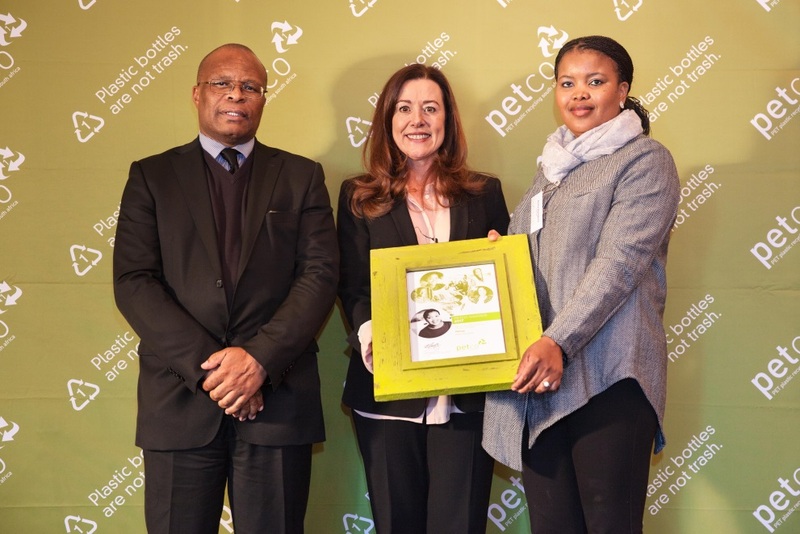 This award recognises partnerships, including government (municipal, provincial or national), regulatory agencies, community organisations and private industry, that have successfully implemented game-changing initiatives, policies or programmes that advance recycling and sustainability in South Africa. The Pikitup partnerships in Johannesburg have resulted in private-sector companies providing technological solutions for waste separation and processing, in addition to community co-operatives, individual pickers and micro-enterprises. The initiative involves households separating their waste into three bags: wet and organic waste; plastics and glass; and paper. Recovery is increased through the involvement of pickers, co-operatives and community participation in buy-back programmes, and their roles are also being formalised through this model. In the last 5 years, Pikitup, in partnership with Jozy@Work, has increased its Separation-at-Source programme to include 56% of households within Johannesburg. This has enabled the City to divert 21 000 tonnes of its waste in the 15/16 financial year. 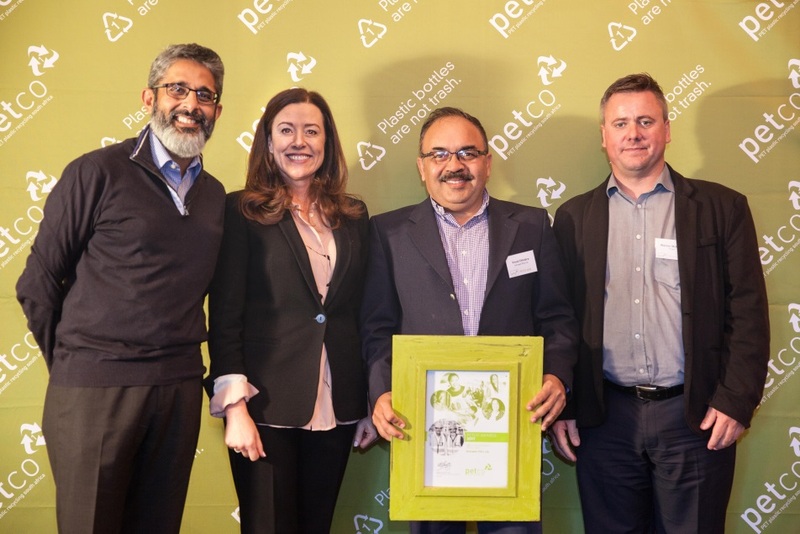 This award recognises a PET recycling facility that is a leader in one or more key measurements: innovation, volumes of PET collected and/or processed, site improvements and sustainability measures adopted. Extrupet’s PhoenixPET™ has been at the forefront of innovation by being the first rPET used in, amongst other products, carbonated soft drinks, bottled water, fruit juices, liquid detergents and sheet thermoforming products. In one month alone (May 2016), Extrupet purchased over 3 000 tonnes of post-consumer PET bottles – the first time in PETCO’s history that this has been achieved by a single recycler in a given month. This award recognises an individual or an organisation whose ingenuity and perseverance have created and sustained successful business ventures in the PET collection or recycling sector that directly benefits and uplifts the communities within which they operate. Re-livingCOP17 is a Non-Profit Organisation run by Smangele Chirwa that seeks to educate and motivate communities about measures for the implementation of resolutions taken at the major international COP17 event. It is the only buy-back centre in Esikhawini Township, Richards Bay, and works to educate the community about the importance of recycling through door-to-door awareness raising activities and campaigns at schools, parent meetings, churches and community meetings. Through their programmes, they collected 3 418 kg of PET during the course of 2016. This award recognises an individual whose entrepreneurial insight, ingenuity and perseverance has created and sustained a successful, growing business venture in the PET collection or recycling industry. Nokubonga Mnyango, owner of Uthando Solutions and Trading (Pty) Ltd.
Nokubonga resigned from her job at the end of 2015 and decided to start collecting recyclables. Today, she has more than doubled her monthly income and, with the support of her husband, operates her business from home in the township of Ngwelezane outside Empangeni. 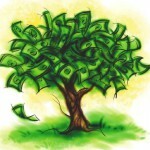 Recently, she has been offered premises by the Department of Environmental Affairs at the uMhlathuze Municipality and is in the process of moving her business. She collects waste from taverns, shops, and schools and supplied 3 690 tonnes of PET to Mpact in 2016. She now employs 2 permanent employees and, in the busy season, hires more than 59 casuals. Managed and run by Maxwell Ndlovu, the Denver buy-back centre employs 5 sorters on site and collectors delivering to the centre created an additional 20 indirect jobs. 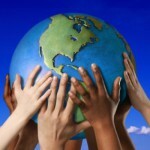 Total volumes are approximately 50 tonnes of paper and PET per month and approximately 10 tonnes of other recyclables. Projected growth in volumes is set for around 100 tonnes by the end of 2017. The company has recently employed 136 people with funding from Jozi@work for street cleaning, environmental education awareness and recycling for a period of four months. 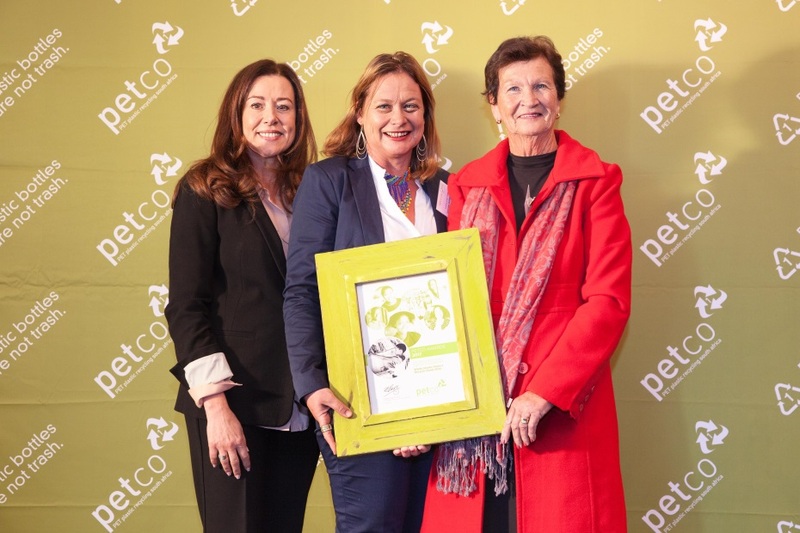 This award recognises a female in the South African recycling sector who has demonstrated admirable leadership, business acumen and strategic foresight in driving and growing South Africa’s economy through recycling. Charlotte started her recycling initiative in Sept 2007 in Riversdale, Western Cape. Within a year, she had convinced the Municipality of Riversdale to implement a two-bag system. Her company now runs the two-bag system in Still Bay, Jongensfontein, Riversdale and Heidelberg and she has agents in Knysna, Montagu, Barrydale and Uniondale. Total volume of material recycled during 2016 was 3 287 308kg and total PET during the same period was 57 392kg or just over 57 tonnes. Through the buyback centres they support approximately 400 entrepreneurs per month, buying material to the value of between R58 000 – R 68 000. A total of 81 people are employed 48 of whom are women. This award recognises a journalist or a media personality that is actively driving awareness of recycling and general sustainability issues, and has made an outstanding contribution to the understanding amongst consumers of issues pertaining to reduction, reuse and recycling. This year we asked journalists to enter a piece that they had written in the past year pertaining to recycling and sustainability. We had 11 entries and Sindy Peters’ piece was the most original.